TravelCompanion gives you freedom to travel. With TravelCompanions easy to use interface on the travellers own smartphones, the system will make your journey safe and smooth. 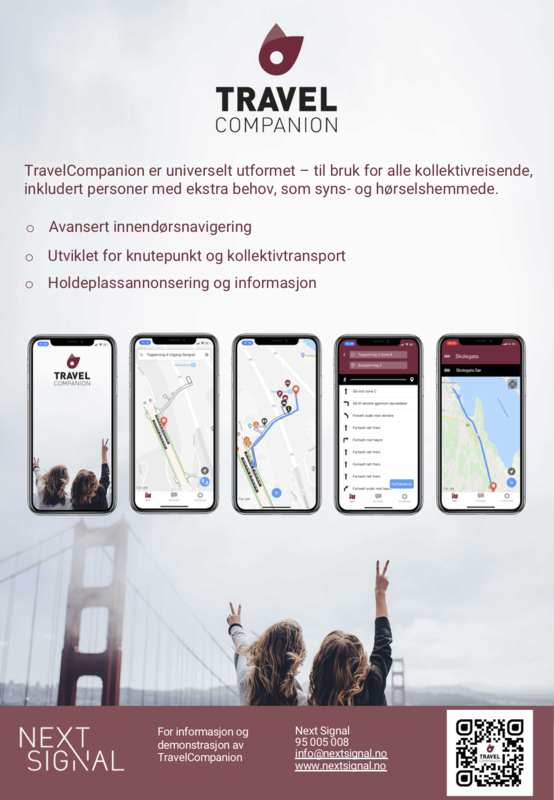 TravelCompanion is a beacon based system that will guide travellers who are using bus, trains, subway, trams and airplanes. The system is universally designed with special emphasis on visual- and hearing impaired people. This system will significantly improve implementation of Universal Design in transport, making society more accessible for everyone. TravelCompanion aims to guide throughout the whole journey across different types of transport. It is developed to be compatible with the Wayfindr Open Standard for audio-based navigation.